Disc Cred: Chris Max Voigt is one of the greatest distance throwers on the planet. 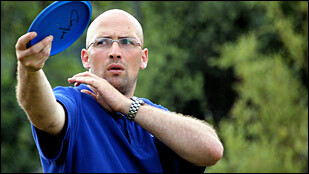 In 2001 he set an official world distance record of 712 feet (217.02 m), throwing the Discraft XS. Winning $1,000 at my first (and only) SuperTour victory in Waco, TX, in 1998 while on a U.S. Tour. Playing in Japan for the first time with my long time friend John Ahart. Battling for 1st place with Crazy John Brooks at several EuroTour events. 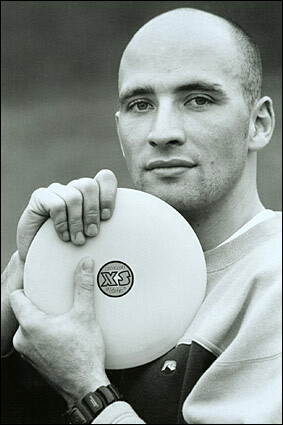 Becoming member of Team Discraft in 1996. Having two Aces in one day at Gurten in Bern, Switzerland. Seeing my discs fly for more than 20 seconds when I emptied my bag up top of the Aspen mountain after a bad round. Watching Scott Stokely throwing a sidearm for over 450 feet over water. Watching my friend Mike Randolph playing the hottest Disc Golf ever at the PDGA Worlds Final in 1995, Port Arthur. Gaining around 20 places in the semi-final round of the same Worlds due to smashing the very long Circle R course. Witnessing Ken Climo playing 8 birdies on 9 holes at the PDGA Worlds Semi-Final at Hudson Mills. Watching people tee off at the scariest hole in the world, hole 18 of Atzmaennig, Switzerland. Improve Your Swing and Distance: I see many players swinging back too close to the body and thus releasing early. Bring your arm around with the upper body, not forward in a straight line. Feel the acceleration line. You'll find more distance if you slowly use more back and hip rotation and learn to accelerate in the following order: 1) hip 2) upper body 3) arm. Better and Safer Putting: If you aren't consistently hitting the basket and perhaps missing to the right and left, you may be using too much wrist snap when putting. This style can work, but needs lots of practice to stay consistent and is hard to keep up with in nervous moments. Learning to use the bigger and slower shoulder muscle to sort of lob the disc with an up and down movement helps to get more consistent and stay close to the basket when missing. When he isn't bombing some of the longest drives in the history of disc sports, Chris Max Voigt is an attorney in his hometown of Munich, Germany. Leicester, MA Professionally kept. Long and Challenging. Pay to Play. Stockholm, Sweden Professionally kept. Pay to play. Europe's gold course. La Mirada, CA It has palm trees!! Emotionally rated high. Port Authur, TX Best PDGA Worlds memory. Long and tough. Ann Arbor, MI Good shape. Nice tees. (max weight) Very fast and overstable. Good into the wind. Taken into bag right away. (max weight) A must for maximum distance. This is the fastest disc I have thrown on a disc golf course. It penetrates like no other disc, but is very good to handle and not too overstable. The disc holds high speeds but does not fade back too early when slowing down. (max weight) This is for very strong headwinds or hyzers that are not supposed to flatten out at all. It is also great for s-curves. (max weight) Very nice and straight lines with not much effort. It is faster than average midrange discs and travels far enough on low ceiling shots. (max weight) With the ESP plastic, the Buzzz became unbeatable. It stays straight with even some more power on it and it does not turn on you when throwing your short drives or upshot, yet it is not too stable to hyzer out too early. (max weight) The Magnet is the PUTTER. No need for anything else. Also good for short drives or helicopter shots that need to come straight down in the end without curving. It feels great in the hand and is not too thick as compared to other models of competitors.